The Santa Barbara County Sheriff’s Office is pleased to announce the graduation of four Santa Barbara County Deputy Sheriff Trainees from the Allan Hancock College Law Enforcement Academy. After 21 weeks of instruction, the graduates received their certificates of completion today, December 5, 2018, at a formal ceremony held at the Allan Hancock College Public Safety Training Complex in Lompoc. The graduates are among 17 total recruits in the Academy and range in age from 26 to 42. 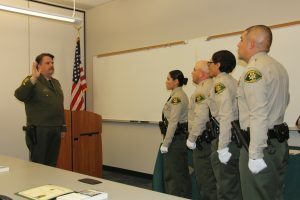 They come to the Sheriff’s Office with a variety of backgrounds and life experiences including a former Santa Barbara County Sheriff’s Office Custody Deputy, a former Program Coordinator for the Santa Barbara County’s Sexual Assault Response Team, a retired United States Army veteran and a United States Navy reserve member. The graduates completed the California Peace Officers Standards and Training basic course, which included more than 850 hours of instruction. Some of the instruction included Leadership, Professionalism and Ethics, Crimes against Persons and Property, Laws of Arrest, Emergency Vehicles Operations, Report Writing, Arrest and Control techniques, Lifetime Fitness and Firearms training. The Law Enforcement Academy is designed to prepare students mentally, morally, emotionally and physically to continue their training within the Field Training Program. 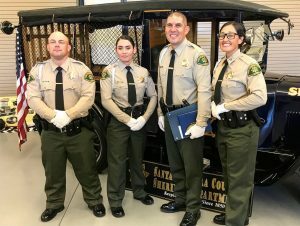 From the Santa Barbara County Sheriff’s Office the graduates include: Guadalupe Ibarra, Miranda Moreno, Gordon Williams III and Flavio Vargas. The Sheriff’s Office wants to congratulate Deputy Sheriff Trainee Guadalupe Ibarra for receiving the Leadership and the Report Writing Awards. Deputy Sheriff Trainee Flavio Vargas was awarded the Leo Ortega Most Inspirational Recruit Award. We also want to recognize Deputy Sheriff Trainee Gordon Williams III for receiving the Doug Odom Firearms Award and the Emergency Vehicle Operations Course, safe driver award. We are excited to welcome this great group of new Deputy Sheriff Trainees to our Sheriff’s Office family. The Sheriff’s Office is currently accepting applications for Deputy Sheriff Trainees. This is a tremendous opportunity for individuals who want to make a positive difference and serve their community while pursuing a career in Public Safety. 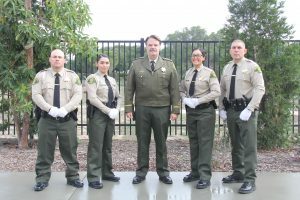 To apply, go to our website at www.sbsheriff.org and click on the Join Us section or you can go to our recruitment Facebook page at www.facebook.com/sbsorecruitmentteam/.